Own Bossy – don’t ban it « "TeresaBruceBooks"
I remember when sassy was a bad word, as in “don’t you sass me young lady, I’m your mother.” It was only as an adult that “sassy” became a positive label – overused and cliché when used to describe Southern women – but still largely self-applied in a you-go-girl kind of way. So when I heard of Facebook C.O.O. Sheryl Sandberg’s campaign to ban the word bossy I was conflicted. I agree with the premise of her much denounced book – I’m not happy unless I’m leaning in. Any former almost-Olympian knows that lean in is a synonym for compete. With all you’ve got. So I wanted to get on board with Sandberg’s clever, intentionally oversimplified plot to encourage young girls to lead. As the ban bossy website points out, between elementary and high school, girls’ self-esteem drops 3.5 times more than boys and they’re less likely to want to lead, even as adults. Ban Bossy is an ingenious PR campaign that keeps Sandberg’s feminist platform in the limelight and brings an important issue some warranted attention. But I’m also a writer. We celebrate words, particularly those rich in nuance and connotation. Banning a word is as knee-jerk unthinkable to writers as burning a book. And I’m terrible at keeping up with political correctness. My nieces had to remind me for years that “stupid” is on the does-not-fly-anymore list. I get that kids can be cruel and hearing a bratty sub-teen turn the word stupid into a sibilant, drawn out insult makes me cringe. But so does substituting “ill-conceived” or “misguided” when I find myself describing things that are just plain stupid. I was still trying to find my inner Beyoncé or Jane Lynch (check out their video supporting the bossy ban) when I happened to meet two Thunderbirds at an airshow in Florida this weekend. 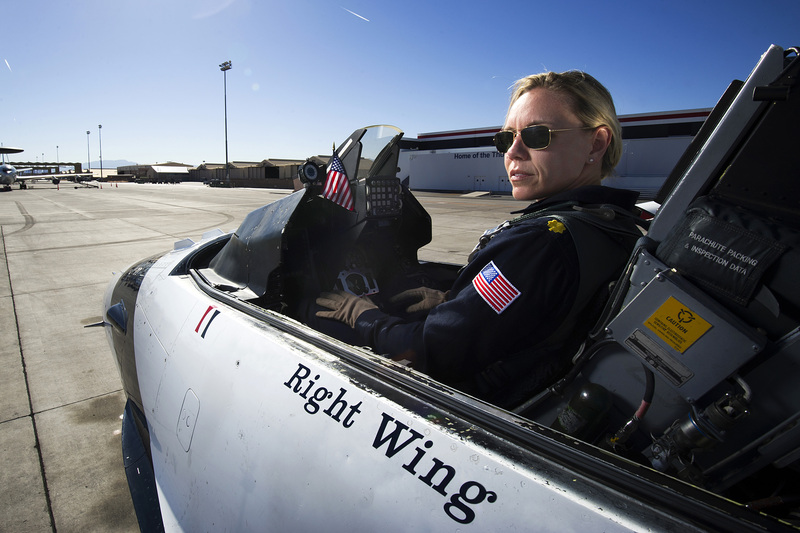 Major Caroline Jensen is the fourth female pilot to fly with the Air Force’s premier flight team. 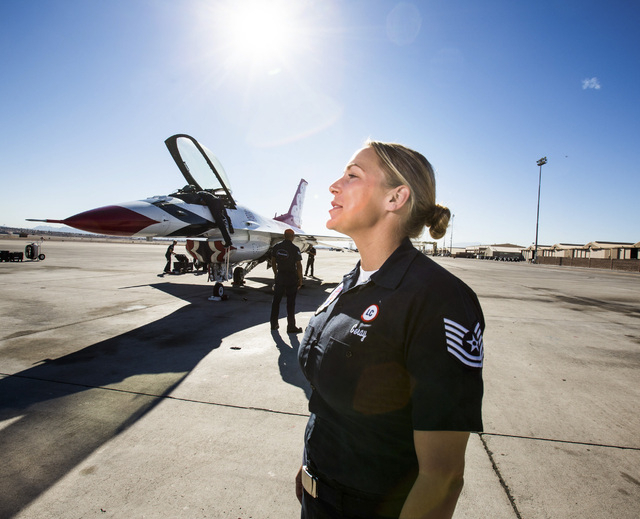 And Tech Sgt Amanda Geray is the first female line chief in the team’s 61-year history. 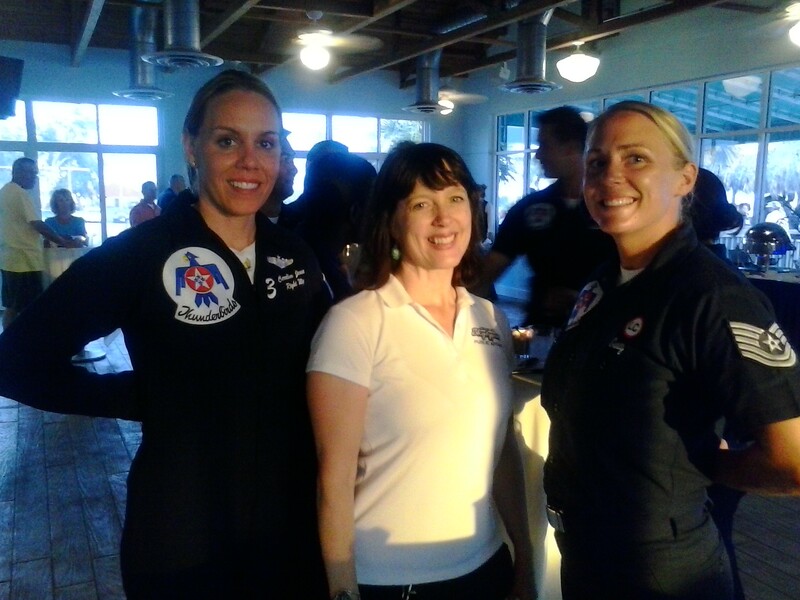 Perhaps it was because we were at an official reception and they were in full Air Force role model mode but neither of these two accomplished young women had heard of the Ban Bossy campaign. “Ban the actual word bossy?” 30-year-old Geray asked. “You’ve go to be kidding. I am the boss. Just ask any of the mechanics on my line.” Maybe it’s because she was born and raised in North Pole, Alaska (for real, check out her bio) but Geray is utterly confident that her skills prove her equality. She’s proud to have been the girl in high school shop class, the girl who fixed cars, the girl who could hold her own. That’s when it hit me. I’m no gender-barrier-breaking Thunderbird but I do direct mostly-male film crews. In corporate shoots overseas, I’ve been ignored by grips and gaffers who assumed that my husband was the boss. And I’ve enjoyed setting them straight – I’m not going to lie. When a crew in Latin American bought me a baseball cap that said “Director” – just so it was clear they knew who the jefé was – I laughed and said I wanted one that said “Dictator.” Just ask my younger sister. Deep down I’m bossy and proud of it. What I realized when I heard the Thunderbirds say the same thing, in their own way, is that when you own a word, even celebrate it, you erase any derogatory intent. Sassy, Gay, Feminist, Bossy whatever – if you appropriate the label you define it for yourself. Girls don’t need to be protected from words that might hurt their feelings. They need bossy role models and bigger dictionaries. This entry was posted in travel and tagged Sheryl Sandberg, Teresa Bruce.